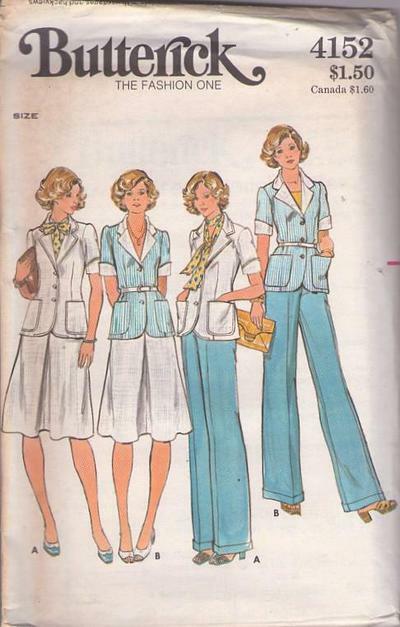 70s Office, Retro Separates Clothing Patterns - MISSES' TOP, SKIRT & PANTS Semi-fitted top has notched collar, above-elbow length sleeves with turned back cuffs, patch pockets, side back seams, and front buttoned closing; solid or bi-color. With or without topstitch trim or self belt with purchased D-ring buckle. Slightly below-knee length, A-line skirt darted into waistband has inverted center front and back pleats. Straight-legged pants darted into waistband have cuffs; optional topstitching on waistbands.